Ziggy Marley is bringing music to the LITTLE people! He is releasing his first children’s album and has invited some family and pretty cool friends to join him on it. Jack Johnson, Laurie Berkner, Elizabeth Mitchell, and Jamie Lee Curtis are only a few of the artists featured on the CD Family Time, in stores May 5th. 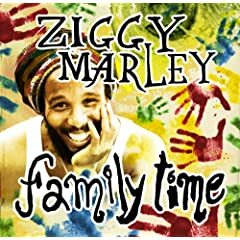 In addition to some well known classics like “This Train” and “Hold Him Joe” Ziggy has written many original songs on this release which are endearing tributes to his family with many sage words of wisdom for kids. below. Last date for entries is May 12, 2009.